A 1-0 win over Fulham earlier in the week lifted Huddersfield to 18th place. 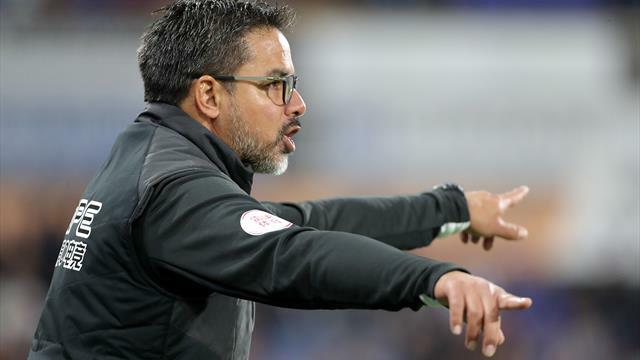 Huddersfield boss David Wagner has targeted rare back-to-back Premier League wins for his side in Saturday’s home game against West Ham. The Terriers clinched their first league victory of the season against Fulham on Monday to climb off the foot of the table and Wagner is determined to follow up with another three points. His side, who last won successive league games nine months ago, could climb out of the bottom three if they beat the Hammers. “Everybody knows how important back-to-back wins are in the Premier League. We only did it twice last season and now we have another chance in front of our home crowd. Huddersfield won their first two league games last season – against Crystal Palace and Newcastle – and beat Bournemouth and West Brom in successive fixtures last February. Wagner described Monday’s 1-0 victory against Fulham as one of the most important during his three years in charge. It halted a 10-game winless run from the start of the season – 14 in total – while Christopher Schindler’s header, which deflected in off Timothy Fosu-Mensah, was their first goal at the John Smith’s Stadium since April. “I’m very proud of my players,” Wagner said. “It wasn’t a lucky win, it was a win with real spirit and they played in the style we wanted. “I’ve never doubted the character or the mentality of this group because they have shown too much in recent weeks, and I have seen them everyday in training. Terence Kongolo recovered from a hamstring strain in time to face Fulham after a three-game absence and Wagner made clear the crucial role the club’s record signing can play this season. “He is a warrior,” Wagner added. “Once he puts the shirt on and steps on the grass, he’s a different character compared to off the grass. “Because of him we can play different formations. He’s very reliable, very strong at defending one-on-one and very calm on the ball.